To the delight of Hepcats, Lindy Hoppers and lovers of Swing Jazz, the brassy, all singing-all dancing-all-American 1940’s musical revue, returns to Australia in celebration of its 20th season. 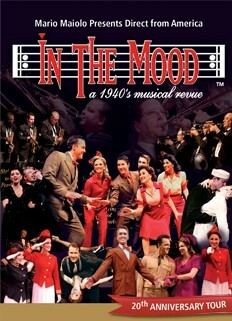 In the Mood is much more than a concert and recreates defining moments with the hypnotic String of Pearls Big Band Orchestra, In the Mood Singers and Swing Dancers from New York, sizzling choreography (from Alex Sanchez - a veteran of 10 Broadway musicals), sassy costumes and an authentic score of over fifty unforgettable hits. The 1940’s was a time when America was in tune with sentimental ballads and up-tempo Swing Jazz rhythms, where the waltz and fox trot competed with the wild, acrobatic jitterbug, jive and boogie woogie crazed Hepcats, crowding the ballroom dance floor. This production has travelled throughout the USA (including the 1997 Inauguration for President Bill Clinton), Canada and Europe and was selected by World USO as an official entertainment for the 50th World War II Commemoration. In the Mood is world class family entertainment. The Down Under season in 2011 sold out 32 high-energy performances and Australian influences from that tour are reflected in this 20th year celebration. If you’re in the mood for a sensational nostalgic journey through the music and movement which guided a nation’s spirit towards hope, promise and prosperity, don’t miss out. Book now!